Saint Augustine’s Church on O’Connell Street has a prime location on the main street in the heart of Limerick’s city centre. 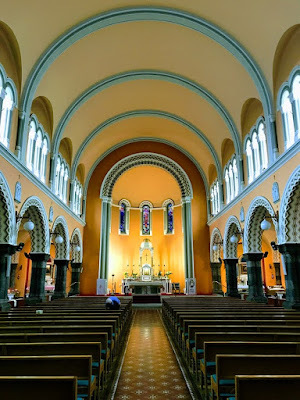 The building, which has a strong street presence, is one of Limerick’s landmark buildings and I called in this week to visit the book shop and to see what liturgical resources were available. The present Augustinian community traces its origins in the city to 1633, although they link back to earlier Augustinian house in Adare, and Augustinians have been in Limerick City since the 13th century. The Augustinians trace their origins back to Saint Augustine of Hippo in North Africa. A number of scattered and diverse communities followed the Rule of Saint Augustine, and some of these came together under one Prior General in 1256. By then, the Augustinians had spread throughout Western Europe, and by the end of the 13th century there was at least four Augustinian communities in Limerick: the Canons Regular, the Friars of the Cross, the Hermit Friars of Saint Augustine, and the Canonesses of Saint Augustine. At times, it is difficult to disentangle the different stories of these pre-Reformation houses in the Quay Lane, Merchant’s Quay and Fish Lane area. One was said to have been founded by the O’Briens of Thomond, another during the reign of King John. They had dedications to the Holy Cross, Saint Mary and Saint Edward, and ran a poor hospital. The privilege of casting the first vote in the election of the Mayor of Limerick was claimed by one of these Augustinian houses, and the position of Prior was often hotly contested in the late mediaeval period. When Eugene O Faolain was removed as Prior in Limerick in 1476, he became the prior of the Trinitarian Monastery in Adare, which was often in contention with the Augustinians in Adare. After the suppression of the monastic houses at the Reformation, Holy Cross Priory and Hospital in Limerick were granted to Edmund Sexton in 1537. The Sextons retained the prior’s privileges, including casting the first vote in the mayoral elections. This estate became the core estate of the Sexton and Pery families, and their descendants, the Earls of Limerick, who had a seat in Saint Mary’s Cathedral as Priors of Limerick. The Augustinian foundation in Adare was also known as the Black Abbey, and the church is now Saint Nicholas’s Church of Ireland parish church. The Augustinian presence in Adare continued without interruption until the reign of Elizabeth I, when their lands were granted to Warham St Leger in 1567, although the friars may have remained in their house until about 1585. The Augustinian house in Adare was finally suppressed in the Cromwellian era, but members of this Augustinian community had already moved from Adare into Limerick City, and in 1633 they founded a chapel in Fish Lane. In 1778, the Augustinians built a small chapel in Creagh Lane, and they remained there until 1823. A year earlier, in 1822, they bought the Limerick Theatre on George’s Street (now O’Connell Street) for £400, although the theatre originally cost the public £5,000 to build. The community spent £600 on improving the building, and the original structure remained in use as a church until 1939. The former theatre was replaced by the present church, which is an ambitious exercise in Hiberno-Romanesque Revival architecture, although it was built much later than one would be expected for this style. The original proposed façade had two towers, but only one was built. The church was designed by the architectural partnership of Jones and Kelly and was built in 1939-1942 by GS Wallace and Son of Dublin at a cost of £49,000. The foundation stone was laid in March 1939, and the church opened on 20 December 1942. This is a double-height, gable-fronted, Hiberno-Romanesque church with a west facing street front and a square-plan tower to the north. The gable ends each have a stone Celtic cross at the apex. A large Romanesque window with four lancet windows filled with stained glass and four round-headed arches at the ground floor level dominate the street frontage. On the right, at the entrance to the church on O’Connell Street, is the original lintel stone dated 1633 from the order’s earlier chapel in Limerick at Fish Lane. The O’Doherty family saved this stone in 1933 when the buildings in Fish Lane were knocked for new houses. The stone was kept in a stone-cutting yard until it was brought to the attention of the Prior, Father Vincent Lyons in 1961. He bought the stone and it was inserted into the wall of the church in October 1962. In the porch are two holy water fonts from the early church in Creagh Lane. Saint Augustine’s Church has an extensive and valuable collection of stained glass windows from the Harry Clarke Studio. The semi-circular half-domed apse to the east has a stepped Romanesque arch with a heavy chevron motif, supported by four colonettes with cushioned capitals. The five windows are by the Harry Clarke studio and represent Saint Joseph, Saint Monica, Our Lady of Consolation, and Saint Nicholas of Tolentine. The principal west window is also by the Harry Clarke, studio with a decorative plat-archivolt supported by long colonettes and with the organ gallery in front. This west window has been described as ‘a symphony of light and colour.’ The four long panels depict scenes from the life of Saint Augustine (from left): Saint Augustine’s conversion, his consecration as bishop, writing his Confessions, and with his mother Saint Monica at Ostia. Below are four symbols of his life: the book and quill, twin symbols of the Augustinian Order and the scales of justice. The window is dedicated to Father Joseph Hennessy (1872-1941), who played a key role in the planning and building the church. In the side aisles, the church has traditional shrines dedicated to Saint Jude, Saint Therése, Saint Nicholas, Saint Anthony, Saint Joseph, the Sacred Heart, Our Lady of Good Counsel, Saint Augustine and Saint Monica, Saint Rita of Cascia and Padre Pio. The interior of the church was redesigned and refurbished in the 1990s. The church was divided into a worship area and a hospitality space by an ornate screen mirroring the architectural features of the church, with the Millennium glass doors at the entrance to the worship area. The Abbey Bookshop and gift shop is on the left inside the entrance doors, and there is a pastoral care area, hospitality and exhibition spaces, and a peace garden laid out in 1997 to commemorate the Good Friday Agreement. In 1998, a silver chalice was discovered in a cylinder at the back of a safe behind the high altar. The inscription says Dame Alice Nagle donated it to the Augustinian Sisters in Dublin in 1750. The bells of the church are believed to have come from a church in London. When Father Larry Doyle heard the bells had been brought to Ireland, he bought them for the church. The Augustinian priory next door stands on the site of the Country Club, built in 1825. The Augustinians rented the ground floor of the premises in 1897 for £2,075 from Dr Pryce Peacocke for a lease of 999 years. They bought the building for £15,000 in 1946, and the priory was officially opened on 25 May 1948. Meanwhile, the FitzGeralds of Kildare retained the title to the former Augustinian friary in Adare. In 1713, Robert FitzGerald (1675-1744), 19th Earl of Kildare and grandfather or Lord Edward FitzGerald, sold the buildings to Valentine Quin, grandfather of the first Earl of Dunraven. Lord Dunraven reroofed the church in 1807, gave to the Palatine community for use as a church. In 1811, it became the Church of Ireland parish church in Adare with the name Saint Nicholas.